I believe that animals should not be used for entertainment because of how they are mistreated,and how so many circuses have proved that it is possible to operate without animals in their circuses and still make a profit. Now I want to know how many of you have just recently gone to Stardust Circus? Have you seen how they treat the animals? It has been proven, that their training is often based on fear and punishment - No, bears, elephants, tigers, and other animals do not volunteer to ride bicycles, stand on their heads, balance on balls, or jump through rings of fire - actually they would rather be out in the wild than take in the lifelong suffering that they go through for the sake of a few minutes entertainment for us humans! Between shows or in the off season animals are kept in small transport cages for over 100 hours or chained to the same spot for days. They go without food water or warmth and often don’t see daylight when locked away in trucks. No wonder circus animals go on a rampage. Every animal, just like a person, has their breaking point, from the day they are ripped away from their mothers as a baby, they are punished over and over again with blow torches, bullhooks, whips and electric sticks. There has been many cases recorded, of animals turning on their trainers, like Janet the elephant who ran away with 5 children on her back, she was shot down with 47 bullets that day, because she could not go another day of punishment. 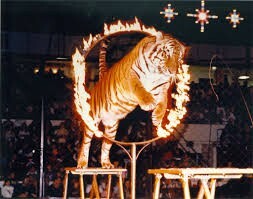 To conclude all of these reasons I strongly believe that animals should never be used for entertainment. 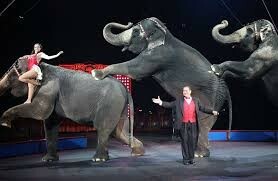 by supporting a circus containing animals you are convicting them to a life of pain and punishment. So please, stop the harming of animals and support an animal free circus. Our animals deserve the right to be free and live a natural life, not to live a life of pain.